Only 2 posters now left, found today April 15th, 2017 in the back of a cupboard. If you are interested in buying posters of Mentzer, Zane or Sergio, please let me know. New posters are being planned. Zane will be next. For poster & print enquiries, email me at wayne@gmv.com.au for more details. Master photographer Wayne Gallasch has selected some of the very best muscle photos from his archives and is releasing the first one as a limited edition full color poster. The first poster released is a classic shot of the late great Mike Mentzer taken by Wayne in 1977 at the bodybuilding Mecca Muscle Rocks, CA. 23.39" (594mm) high x 16.54" (420mm) wide: ready for framing. Printed on thick 240gsm SATIN art paper and printed to the highest quality. Only 100 posters will ever be printed and each poster will come with a Certificate of Authenticity with a unique number, signed and dated by Wayne Gallasch. WE CAN THEN CHECK ON THE AUTHENTICITY OF ANY SUCH POSTER BEING OFFERED. This incredible collector’s item costs only $54.95 + postage and handling. This shipment cost will be quoted depending on where you live. Email tina@gmv.com.au for a PayPal invoice, along with your address. Our invoice will then include the correct postage. Or click on the PayPal link above top right. Be one of only 100 people in the world to own this classic Mike Mentzer poster. 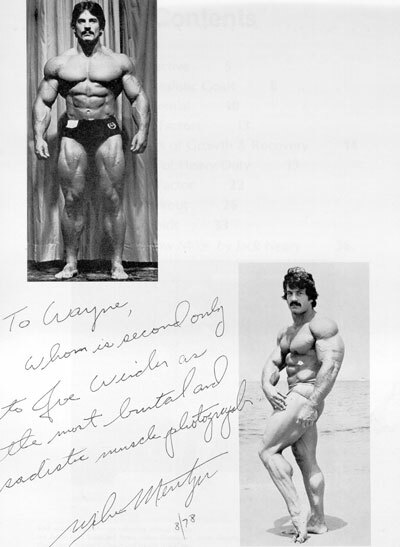 Click here to read Wayne's tribute to Mike and Ray Mentzer. See signed photo at the bottom. Click here for details on the smaller version A3 size of this Mentzer poster. PS-001MM(S). SMALLER SIZE NOW SOLD OUT. DVD #1 Mike Mentzer at the Beach and Muscle Rocks V-112DVD. The second Mentzer DVD which is Mike and Ray in the gym V-121DVD. 3rd and final Mike Mentzer DVD, The Final Chapter, V-208DVD. Triple Pack Special Deal Set of all 3 Mike Mentzer DVDs, V-209DVDSP. The DVD Mike Mentzer & Contemporaries, V-147DVD. Wayne's Tribute June 2001 to Mike and Ray, RIP. Our 9 Years Tribute to Mike in Wayne's Hard News of June 10th, 2010. CONTACT ME at wayne@gmv.com.au if you are interested in further poster releases.